Recycling and waste management operator, Bywaters, has made a major fleet investment by purchasing 30 new Volvo Trucks. The order comprises nine skip loaders, five box vans and 14 hook loaders of various sizes, as part of a deal organised by Stephen Askew at the Volvo Truck and Bus Centre London in Enfield. 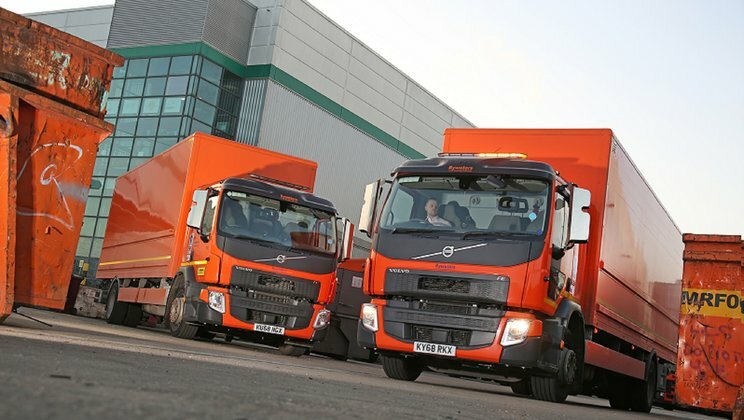 Recycling and waste management operator Bywaters has made a major fleet investment by purchasing 30 new Volvo Trucks. The new Volvo FL 4x2 rigid 18-tonne skip loaders are powered by Volvo’s 7.7-litre Euro-6 six-cylinder D8K engine, which offers 280hp and 1,050Nm of torque. The vehicles have been specified with a lane departure warning system, a rear gearbox mounted PTO, ESP and EBS and come complete with a five-year Dynafleet subscription. Meanwhile, the five 4x2 Volvo FE 18-tonne box vans with cantilever tail lifts from Anteo are powered by the Volvo D8K320 7.7-litre six-cylinder engine which produces 320hp and 1,200Nm of torque and comes ready for use with alternative fuels. The box vans are equipped with lane departure warning technology, forward collision warning system, front air suspension and are also covered by a five-year Dynafleet subscription. Finally, the HIAB hook loaders – which range from 18-tonnes to 26-tonnes – are built on the Volvo FE chassis and powered by Volvo’s D8K320 7.7-litre six-cylinder engine which, as in the box vans, puts out 320hp and 1,200Nm of torque. The new units feature the I-Shift 12-speed automated gearbox, rear gearbox-mounted PTO and EBS, traction control and ESP as standard. “We are comfortable with the fleet at the moment, but we are forecasting expansion within the business and so are exploring new waste management options, which could lead to more vehicle acquisitions. It’s a fast-paced sector, so we don’t know when that might be, but we will be prepared when the time is right,” Taylor concludes.